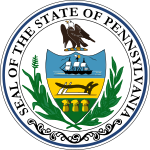 The Pennsylvania gubernatorial election of 1938 occurred on November 8, 1938. Incumbent Democratic governor George Howard Earle III was not a candidate for re-election. Republican candidate Arthur James defeated Democratic candidate Charles Alvin Jones to become Governor of Pennsylvania. ^ "Pennsylvania Gubernatorial Election Returns 1938". Wilkes University. Retrieved 20 December 2012.